Sometime i just can't stop patting my shoulders, you know? Shopping in my closet, I found this "vintage" (read: very old) cropped short sleeves light merino sweater that looked perfect for an update! Easy to do, right? A top, big sequins sew on... done. Today I'll make my own jumbo sequins! Clear plastic sequins like... AQWARD PLASTIC CONTAINERS??? Trashion to the top, and on the top. I am not the type to pull this off safely (we are talking combat pants and Doc Martens here, and lots of tattoos), but I still appreciate a genius knock off. And this IS genius! 405 bucks for something you can so swiftly recreate? Nicely done, girl! A-ma-zing recreation!! 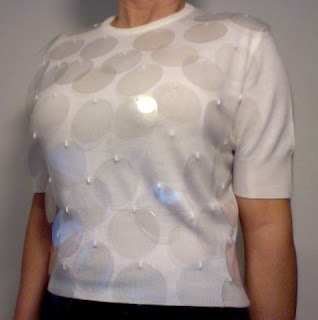 just a question (same for the burberry t-shirt and yours)... what about washing it without damaging the sequins?? LOL, greetings!!! scrunchie shall be! ^_^ thanks for answering! Wow! That is great. I never would have thought of that. You are brilliant!